At the September 22, 2008 Takoma Park city council meeting, the City of Takoma Park voted to authorize a speed camera contract - without discussion - under the same per-ticket payment terms as Montgomery County. "If the total of the City’s paid citation revenues are less than $2,999.00 per month per mobile unit for two consecutive months or for any two months in a six-month period during the term of the agreement or any renewals, the contract provides for a renegotiation of the per citation rate and/or the monthly minimum compensation payable to the contractor. 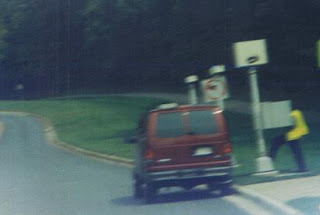 If the City, in its sole discretion, is not satisfied with the results of such renegotiation or with the revenues derived from the photo speed enforcement program or the City determines that photo speed enforcement is no longer an appropriate enforcement mechanism for the City, then the City may terminate this Agreement for convenience pursuant to paragraph 11." This appears to have the effect of establishing a minimum ticket quota for the contractor to ensure that the city does not lose money. Given how profitable the cameras have been in other areas like Chevy Chase, its unlikely they'd ever fall below the $2999 per camera van quota, but it sort of ironic that they might penalize the contractor if the cameras miraculously stopped all speeding in the city. Ticket quotas by law enforcement officers, both formal and informal, are banned by Maryland Statute §3–504. Montgomery County has vigorously defended the legality of its per-ticket-payment contract with ACS on the grounds that, even though ACS performs the day to day maintenance of the hardware and processing of violations, it is the county who "operates" the speed cameras because the county tells ACS where to put the cameras (although their rationale has changed from time to time). The referenced Takoma Park agenda documentation indicates that traffic surveys, which are required to determine which locations are most in need of speed reductions "were conducted in various locations in the City during the months of August and October 2007 by ACS State and Local Solutions." A class action lawsuit has been filed over the matter of the per-ticket payments. In late August a Montgomery County court gave the plaintiffs in that case 45 days to re-file their complaint with Montgomery County (who holds the contract) rather than the cities of Rockville and Chevy Chase as the defendant. The new filing was made on October 6 and the case against Montgomery County is now advancing.